Build the ultimate vegetable garden with this kit. Required rough construction lumber [redwood or cedar suggested, listed lumber is the nominal size, which will likely be larger (thicker) than the actual size]: (6) 2"x10"x12'; (6) 2"x10"x8'; (8) 2"x4"x12'; (1) 2"x4"x8'; (4) 2"x2"x12'; (1) 2"x2"x8'; (4)1-5/8"x1-5/8"x12' (actual size); (1) 1-5/8"x1-5/8"x8'. Note: the lumber boards will need to be further cut into the sizes described in the assembly instructions. Optional: 3'x29' galvanized wire mesh for flooring (1/2" grid) to keep out gophers and moles. For more information visit the GardensToGro website. If you have any questions about this product by Gardens To Gro, contact us by completing and submitting the form below. If you are looking for a specif part number, please include it with your message. 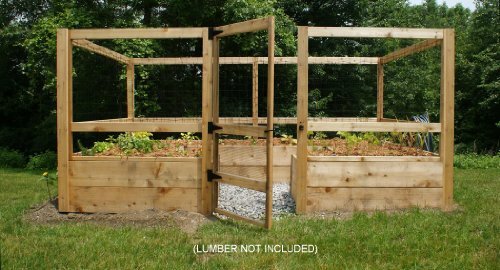 Frame It All 30001510 One inch Series Composite Hexagon Sandbox Kit with Collapsible Cover, 7' x 8' x 11"
Greenes Fence Cedar Raised Garden with CritterGuard Fence System, 48 by 48 by 10.5"